4 Bedrooms 4 1/2 Bath 3 King Sized Masters, Walking Distance to the Beach. Don’t You Love that “New House Smell”…be the first to enjoy it! 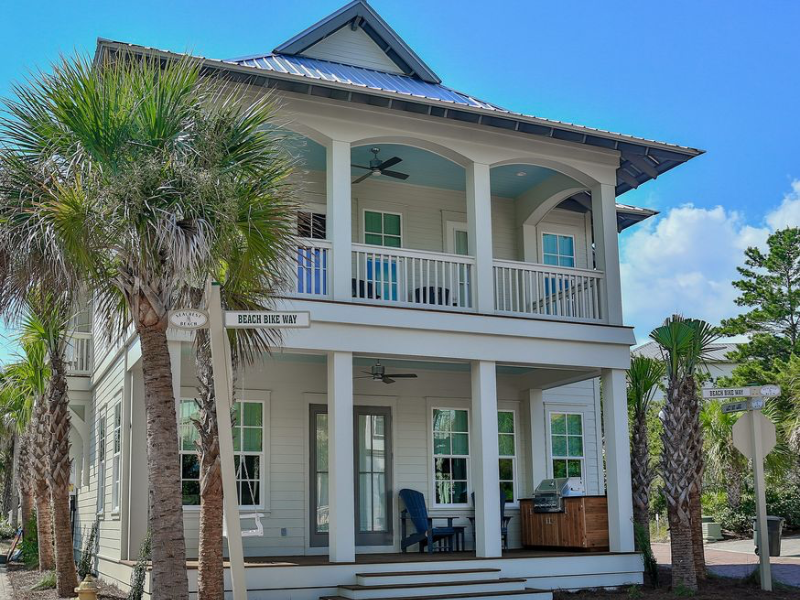 Katmanblu, located at 119 Blue Crab Loop in Seacrest, is a new custom-built home with four bedrooms and four and a half baths that are professionally decorated throughout. Seacrest Beach is nestled between Alys Beach and Rosemary Beach. Surrounded by a variety of dining options, shopping, and entertainment, your family can always find something to do. Katmanblu is a short walk to the beach, or you can hop on the complimentary beach tram service. The tram stop is conveniently located in front of the house for quick and easy access. The community also offers guests access to a luxurious, family friendly, 12,000 square foot Lagoon Pool. Upon entering Katmanblu, you will find yourself in the open concept living area with shiplap accented walls, beautiful hardwood floors, and upscale décor. The kitchen offers stainless steel appliances, a large center island with a farmhouse sink, and beautiful quartz countertops and custom-made barn door. The first floor is also home to a powder room located just off the kitchen. There is bar seating for four to six around the island and seating for six around the dining table. Located on the first floor is the first of three master suites, featuring a king size bed and a luxurious en suite featuring double vanities and walk-in shower. The oversized, inviting front porch offers a relaxing swing and built-in gas grill for your enjoyment. On the second floor, you will find two spacious master suites with king size beds and luxurious en suites, each with double sink vanities and walk-in showers. The fourth bedroom has two sets of built-in full bunk beds with one set containing a full trundle bed. The bunk room has its own private bath with a soaking tub. The second floor also offers a spacious porch with a relaxing swing as well and a sitting area which includes a wet bar. Walk out of the sitting area to a balcony where you can have morning coffee or an evening drink with friends. You can also access this balcony from one of the second-floor master suites. The laundry room is located on the second floor for convenient access.All bedrooms contain flat screen televisions. The bunk room also has a DVD player for your children’s enjoyment.Katmanblu provides three private parking spaces plus more open parking on the street, an outdoor shower, and Wi-Fi. Be one of the first renters to enjoy that “new house smell” and the comforts of home.